Gerber Coupon Pack, value $7+ -- Win a packet of Gerber coupons worth more than $7, 2 prizes to be awarded. Wide assortment of high value savings coupons for Gerber Infant Cereal, 1st Foods, 2nd Foods Purees, 3rd Foods, Juices, and various Graduates Foods, cups, & dishes/bowls/utensils. 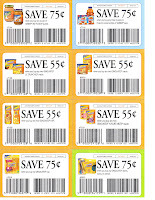 Each winner gets the 8 savings coupons shown, plus several others from Gerber. This giveaway contest ends on January 11, 2010 at 11:59 p.m. PST. Keep coming back to this post to enter this contest daily, if you'd like, being sure to follow the simple rules below. For the MAIN (MANDATORY) ENTRY to win this prize, simply scroll to the bottom of this post and add a COMMENT there stating what you like most about this item. BE SURE to include your email address (in the comment form sign-in prompt box which is not visible to the public) so MommyBlogExpert is able to contact winner(s). Limit of one main entry per day. FTC Disclosure: MommyBlogExpert received these coupons in the mail and is giving these away. MommyBlogExpert did not receive any payment or other compensation associated with this post or this giveaway contest. See complete FTC Disclosure information that appears at the bottom of MommyBlogExpert's main page and at the bottom of every individual post on this blog, including this one. I like Gerber products and I need to make a baby basket for a friend who just had a baby and this is perfect! I run a Canadian coupon train, if these coupons are valid in Canada it would be great to have them! What I like most about these coupons, is that I could use all of them! In fact, I just used some like this yesterday at wally-world. I just found out I am pregnant yesterday- so I really need to stock up on baby products! I love Greber!